This is the flag of the Directorate Regime of China and was designed by KuboCaskett. I linked to his DeviantArt page because I have been criticized in the past for not doing enough to promote the authors of whose works I feature...because being one of the few people who recommends good alternate history art is not doing enough (I'm not bitter, you're bitter). So please help silence a few detractors by clicking on the link. Anywho, the flag is from Ghost Fleet: A Novel of the Next World War by by P. W. Singer and August Cole. I haven't read the book, but given the description, it seems to be a techno-thriller about some sort of near future world war involving the USA, Russia and China. It seems interesting, so I've added to my want-to-read pile on Goodreads, but I'm hear to talk about the flag, not the book. I actually love the look of this flag. 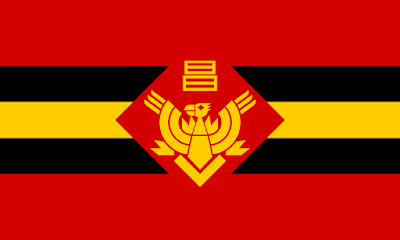 I always enjoyed the color black in flags and the...I'm going to say "eagle"...in the center is pretty awesome and looks almost fascist in its symbolism. If it is on that part of the political spectrum, I'm going to guess China is the bad guy in Ghost Fleet. Overall an awesome flag that introduced me to a new book and allowed me to express some frustrations apparently...sorry about that. What do you guys think of the flag and has anyone read Ghost Fleet? Let me know in the comments. Creator of the featured flag here, and I would thank you for showing off this flag and I appreciate it. Anyway, the "eagle" on this flag is actually a phoenix of the Chinese variety called the Fenghuang and it's one of the icons of Chinese culture; really fitting for a flag from China. And yeah, there needs to be more artistic input into Alternate Timelines for the sake of spicing them up since I'm not much of a wordy person.